An internationally established human-interface technology company asked Fen to support them with the development of a rapid turnaround product demonstrator to help them target the mobile phone sector at the Mobile World Congress. Bringing on-line and coordinating multiple skillsets along with third party suppliers critical to meeting aggressive project milestones within budgetary targets. Analysis of problem, rapid specification at low risk, key component and module selection. 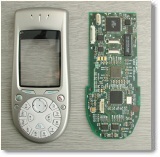 As the project's critical path, the ability to work within tight constraints on pre-defined human interface components, whilst offering flexibility on other aspects, meant that coordination with software and mechanical resource on key areas such as processor/memory choice and connector positioning had to be right first time. Fen's considerable experience in this type of development helped navigate a successful path through his process. An open source architecture that Fen had much experience with allowed a low cost, low risk, quick start-up and progression. Use of established development platforms, and good coordination and API specification between embedded and PC software resource ensured code was running in advance of receipt of hardware and was transitioned to actual hardware on the same day its delivery. Close cooperation within a well established relationship between hardware and mechanical design ensured a low cost, bespoke fixture that was fit for purpose, aesthetically pleasing, and robust enough to withstand regular user handling throughout a busy week-long show. It gave me a real sense of pride to see that the engineers at Fen were able to pick-up and run with such a demanding set of requirements in such a tight timescale. Ultimately Fen's ability to deliver bang on schedule and budget, much to our customer's satisfaction, is the real measure of our success. From the client giving Fen the go-ahead, there was a fixed, show-dependent deadline of 5 weeks. This was the time available to develop, integrate and test the embedded controller hardware, software and mechanics from scratch. The unit had to be robust and aesthetically representative enough to demonstrate to and convince the mobile phone industry that Fen’s client had a credible offering. Fen deployed a series of methods to minimise development time, without introducing any significant risk to the process. Tight project management ensured many parallel activities harmonised and aligned at key milestones. Reuse of pre-fabricated IP, use of some innovative design techniques, good communication with the customer, and utilisation of well-established manufacturing partnerships all contributed to a successful outcome.